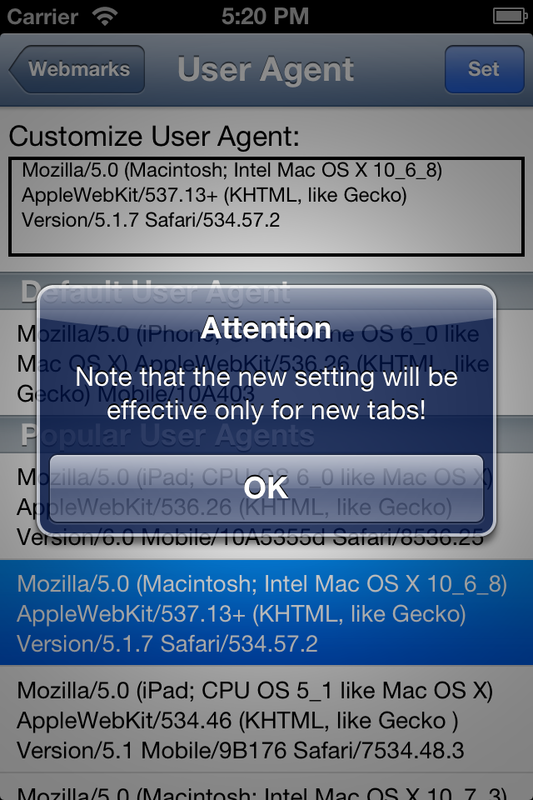 In the world of web browsers, “User Agent” is used to identify the web browser, i.e. browser engine, version, running OS, device types etc. When a website receives web page request from a web browser, it may send back different content for different web browsers. For example, http://www.yahoo.com will return at least three different home web pages for mobile Safari running on iPhone, mobile Safari running on iPad, and desktop Safari running Mac. The reason, it will be presented on different devices for best layout and viewing experiences. Another reason, mobile Safari does not support Adobe Flash, but desktop Safari does. But mobile Safari can play HTML 5 videos, so the web site will send a customized content to mobile Safari. Because the screen sizes of iPhone and iPad are different, Yahoo will send different versions of its home page to iPhone users and iPad users. When your browser requests a web page, it will send a “User Agent” string to the web sites to give the browser information. Based on your browser’s User Agent string, web sites will know what kind of browser you are using, then best version of the requested web page will be sent back to your browser. How about if you want to view desktop version of Yahoo home page on your iPhone? Normally you should set it back to “Default User Agent” in case you experience any problems. Because “Web Explorer” is a mobile browser based mobile “Safari” engine. It does not support some desktop Safari functions.